GB’s Park and Pipe Team Freeskier Tyler Harding at Snozone Castleford. With the winter Olympics less than a month away we are very excited to see what medals Team GB can bring home from PyeongChang. A recent article from BBC Sport discussed the target set by UK Sport of 5 medals for the February winter Olympics and a target of 7 medals for the March winter Paralympics. This would make it Great Britain’s most successful winter Olympics yet. GB Park and Pipe Ski Team at Snozone. We are thrilled to have opened our slopes up to the training of top ski and snowboard athletes over the years and wish them well on their journey to PyeongChang 2018. No matter what the results are, Team GB are all winners in our minds! View the PyeongChang 2018 event schedule here. Live coverage of the games can be found on BBC (BBC TV, the Red Button, BBC Sport website & mobile app) and Eurosport (Remember- Korea Standard Time (KST) is 9 hours ahead of GMT). Snozone will be showing coverage of the Olympics in the restaurant throughout the event. Would you like to follow in the footsteps of Team GB’s winter Olympians? Start with a ski or snowboard lesson at Snozone (Castleford & Milton Keynes) or Skizone. 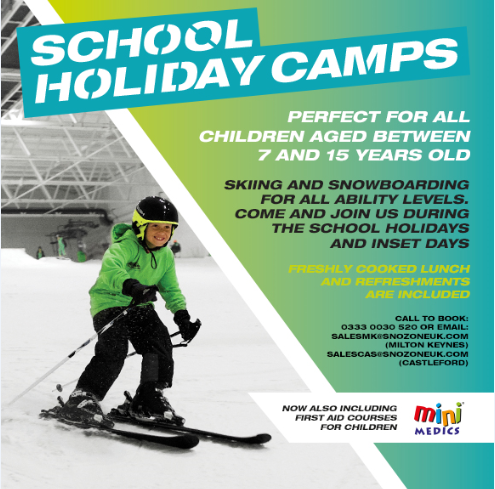 We offer a number of options to learn to ski or snowboard. Ski lessons are available to those of 3 years and above, snowboard lessons are available to those 7 years and above. For details on lessons, head over to our Learn to Ski page or our Learn to Snowboard page. Find out more about Snozone Disability Snowsports here. Previous Previous post: How to conquer your health and fitness goals for 2018!